If you’re looking for something individual, check out this Ruokangas. Beautifully considered design and build that takes the LP Special and runs with it. The textured Bare Bones finish won’t suit everyone. Price reflects its ‘boutique’ build. Looking further afield led us to an unusual choice, perhaps, from Finland’s Ruokangas. Its Les Paul-inspired Unicorn Classic will relieve you of £5k-plus, but a somewhat relative bargain lies in its more stripped-down Unicorn Supersonic. The Unicorn Supersonic is a creative take on a classic. It displays typical Ruokangas ingredients such as Spanish cedar, used for the neck and body, which Juha Ruokangas adopted early in his career. “It’s neither Spanish nor a true cedar,” we’re told. The Latin name Cedrela Odorata means, literally, ‘smells like cedar’. Spanish cedar, or cedro, grows in South America, and it is a close relative to Honduran mahogany. The body is topped with a thin cap of Arctic birch (the ‘Arctic’ is an invented trade name by Ruokangas for this Finnish figured birch) with an Indian rosewood fingerboard and beautifully fettled stainless steel frets, and a similarly raked headstock angle. Closer inspection reveals a three-piece neck lamination and a head splice. The headstock shapes on both are classic; the Ruokangas’ has some relief carving and an uncovered truss-rod access, again perfectly suiting its vintage-informed-but-far-from-vintage-clone design. The Ruokangas’ intonatable wrapover bridge, made from lightweight aluminium with custom-made saddles, uses Schroeder locking posts that actually connect to rear- loaded Lock-Thru-Body studs. Tuners are the increasingly common Gotoh open- backed style along with the company’s lesser known strap locks. With superb-feeling weight, there’s nothing remotely boat anchor about this build. The neck is intelligently done, too, falling into what most would feel is late-50s spec. The acoustic response of the Ruokangas is nothing short of exceptional, too, with a sustaining resonance that seems to hang around for days. You could probably play this guitar for a considerable amount of hours and still find subtleties and shades that you hadn’t discovered before. The Unicorn is, indeed, a mystical beast with quite a complex voice. The controls provide a different drive with more interaction between the volume and tone controls, and although there’s still a slight hump at the end of the volume, we lose fewer highs, which is a taste thing, really. You could certainly argue a modern wiring with no treble bleed helps to instantly tame a P-90’s sometimes spiky high-end. The physical action of the pots is slightly less damped, too, looser in their working feel. Yes, there’s bright crispness, but that’s easily and musically rounded with just a little volume/tone reduction. Noise? Yes, hum pick-up is noticeable, but while something to be aware of, it’s part of the P-90 deal. And when it’s as good as this, it’s a compromise we’re happy to live with. The Ruokangas is eclectic, and with its frankly polarising Bare Bone finish, it won’t be for everyone. But its sound is not only hugely expansive, it’s full of subtlety and nuance and, of course, has plenty of custom options. The boutique Ruokangas is exactly what you’d expect from a small workshop, not least one with more than 20 years of building experience. 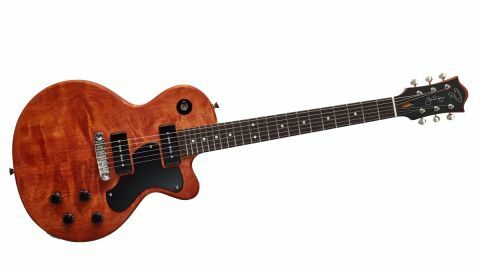 If you’re looking for something individual, check out this Ruokangas: it really gets to the heart of the hallowed Les Paul Special and kicks it off into the stratosphere. Oh, and long live the classic P-90; now into its seventh decade, it remains the bridge between the vastly more popular Fender-style single coil and those early PAF-style Gibson humbuckers. Every player needs at least one!